I had this wonderful, endearing post written on March 3, which was my dog’s 1 year “adoptaversary”. Why didn’t I post it, you ask? Unfortunately I somehow deleted all but one paragraph messing around trying to add pictures from my iPad! Major bummer! I never had a chance to sit down and get back to it until now…almost a month later. 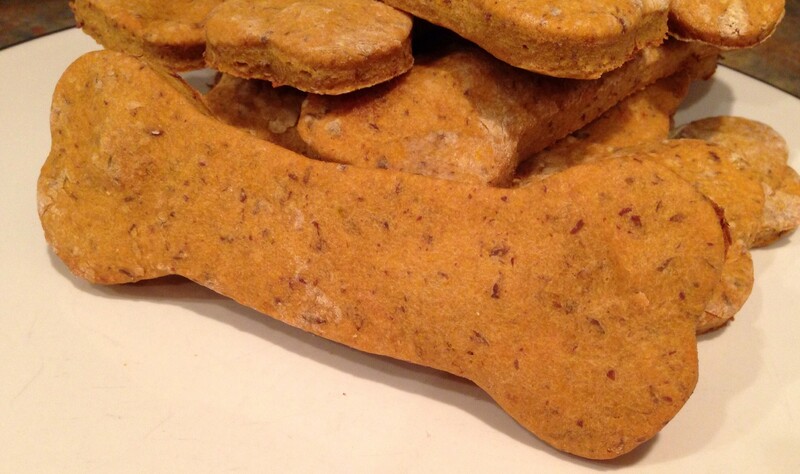 In any case, here is the recreation of that post complete with a homemade doggie treat recipe! One year ago today we adopted our cute and crazy mutt, Gemma Pooches (yes, I gave her a middle name! Is that a problem?). As I mentioned in an earlier post, the adjustment to being a first time dog-mom took me a little longer than I expected. You see, I have never owned a pet…unless you count the beta fish in a vase (remember when those things were all the rage?) I had in college. Sadly little fishy only lasted a week or so…so I don’t really count that. Anyway, I have never really been around animals that much and have had allergies to dogs & cats all my life. I have been getting allergy injections over the past 5 years and my tolerance for dogs improved greatly…doctor gave me the ok to have a pet. Hubby loves dogs and after hearing non-stop about our friends’ dog and seeing the joy he got from playing with him I randomly said “Let’s get a dog.” He said ok, but I know he thought I was full of ‘you-know-what’. I started checking on the internet for adoptable dogs and we spent a few weekends checking out some shelters and adoption events…all with no luck. I finally found a shelter that was a little bit further from us and we headed there to see if we would find the one. I first just have to commend this shelter for being so clean and taking such great care of the dogs. The first thing I noticed (besides the craziness of so many people looking and trying to adopt) was how happy the dogs were. There were other shelters we visited that I literally started to tear up because the dogs just didn’t seem happy or most of them were just lying in their cages looking defeated. They also had many volunteers who were in and out taking the dogs for a walk or to play. Our volunteer knew a great deal about the dogs we looked at and was very helpful. We met a few dogs, but Gemma was the one I had a connection to. Now, this is where I have to stop and say that a year ago I would never have said such a thing…I really didn’t get the whole “animal lover” thing and figured a dog is a dog. There was just something about her, though, and although we liked some of the others I just had to have her. 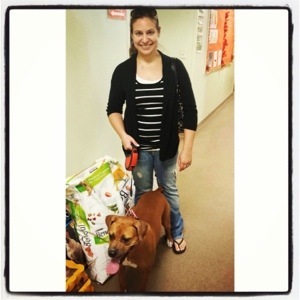 Gemma paying it forward…donating food to the shelter that cared for her until she found her furever family! Gemma was basically everything we said we didn’t want in a dog. For some reason, I had it in my head that I wanted a male dog, not really sure why that was, but in any case Hubby didn’t necessarily care about the gender. We did agree though that we didn’t want a dog that was too young or active. 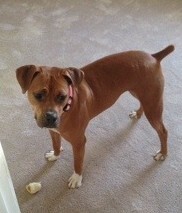 Gemma was female, only 10 months old and although she is half boxer and half beagle…her temperament is ALL Boxer! She is so full of energy and would literally play 23 hours a day if she could (I think she would at least take an hour to eat and sleep!). Our friends cautioned us about “Boxers being crazy, hyper and stubborn.” While this is somewhat true I’ve learned that with the right owner they are awesome dogs! 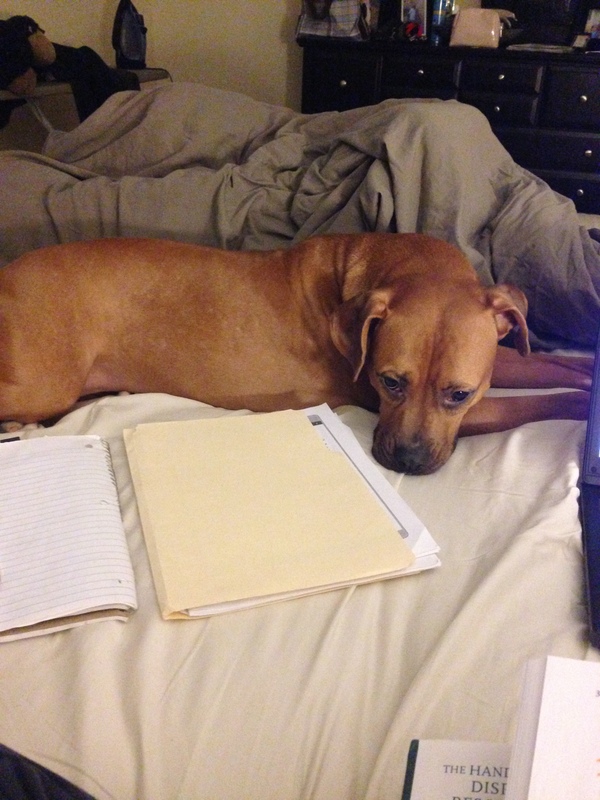 Gemma is a great study buddy! We brought her home and I was completely neurotic…every little thing scared me; I was your typical first time mom…just with a dog instead of a baby! Lucky for me, Hubby is always the voice of reason and doesn’t feed in to my neuroticism…I finally calmed down a bit and Gemma & I enrolled in mommy & me classes…ok not really, it was just basic dog training, but we both benefited greatly. I have to admit that I didn’t think we were going to graduate considering we were put in the timeout room during the first session, but as the weeks went by I gained more confidence and Gemma learned her commands like a pro…I finally saw how smart she really is. After our training and reading lots of books and articles I understood how to be a good pet parent to a headstrong dog and Gemma and I have bonded into best buds. 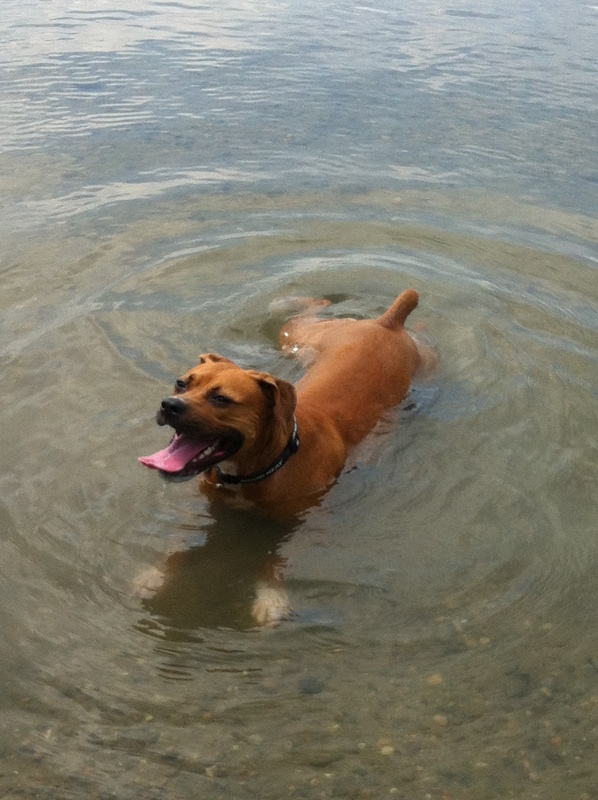 Gemma cooling off in the lake after some dog park fun! Fast forward to the present and I am “one of those animal people”. I love Gemma and can’t imagine life without her. If I can, I take her wherever we go. 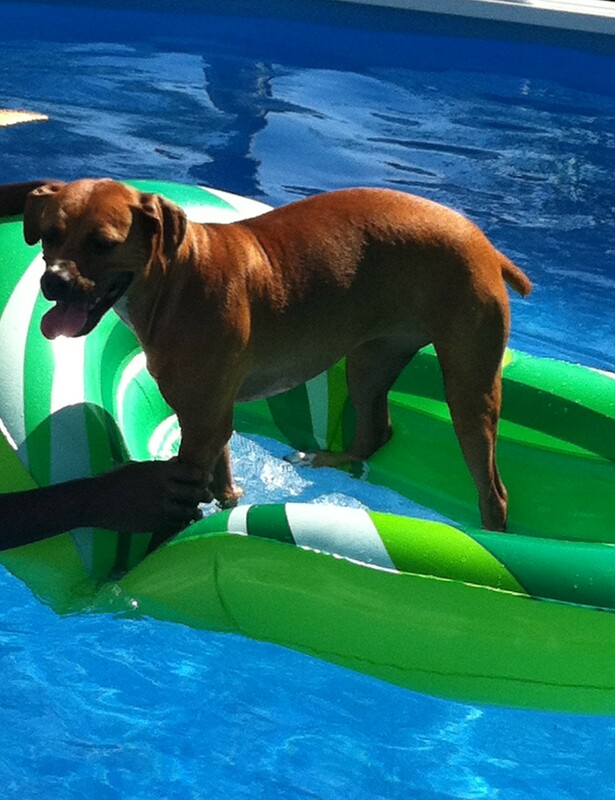 When we went on vacation I called our dog boarders every other day because I missed her so much. I can’t wait to get home each day and see her and look forward to warmer weather so we can get back to our neighborhood walks and play days at the dog park. I post more pictures of her on my Facebook page then most parents do of their children. I still can’t believe I have become this person…and most people who know me can’t either!! Such a transformation. The public service portion of my post is this: For those of you who might be considering a pet for the first time…I say make sure you are ready for the work and responsibility that goes into it…and if you feel you are willing get out there and adopt!! 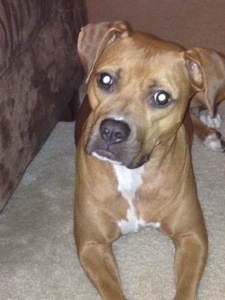 Don’t get stuck on “breeds” or wanting puppies…there are too many dogs who are waiting for a home of their own. Trust your gut…even if the dog you like isn’t what you have in mind! To celebrate Gemma’s adoptaversary I made these healthy (don’t tell her that!) 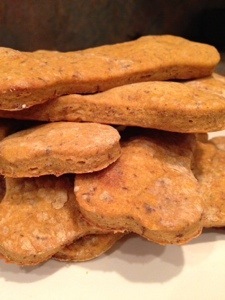 homemade dog treats. The original recipe can be found here. I modified it just a bit omitting the wheat germ (because I didn’t have any) and applesauce, and increased the amount of pumpkin (to make up for the lack of applesauce) and added peanut butter because Gemma just loves peanut butter! Also, this makes a lot of treats, especially depending on the size cookie cutter you use, so I recommend freezing some and taking them out a little at a time. They only last about 5 days since they have no preservatives. 1. Preheat oven to 350 degrees. Line two baking sheets with parchment paper and set aside. 3. In another bowl, combine the wet ingredients; honey, eggs, oil, water, pumpkin and peanut butter. Stir until well-combined. Pour wet ingredients into dry ingredients and mix well. 4. Form dough into a ball and roll out flat onto a well-floured surface until about ¼” thick. 5. 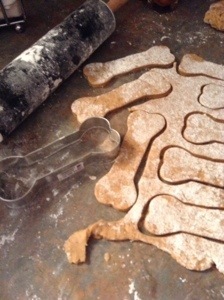 Using a cookie cutter, cut out shapes and place on prepared baking sheet. 6. Bake for 30 to 40 minutes or until treats are very brown and very hard. As the pressure of school is upon me, I haven’t had the opportunity to write my weekly recipe post today. Instead I’m reblogging a post I wrote last year about the adoption of our dog, Gemma. Today is her 2 year adoptaversary and she has been a great addition to our family. She is still as crazy and loveable as the day we met her and I can’t imagine life without her. So how about you? Do you celebrate special days for your pets (adoption, birthdays, holidays)?